Arthur M. Blank (born September 27, 1942) is an American businessman and a co-founder of The Home Depot. Today he is known for his philanthropy, his ownership of the Atlanta Falcons in the National Football League, and his ownership of Atlanta United in Major League Soccer. He is a director on the board of Cox Enterprises. 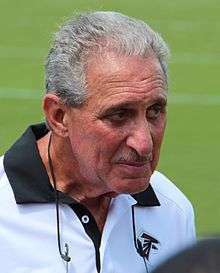 Arthur Blank was born to a Jewish family, in Queens, New York, with his father, Max; his mother, Molly; and his older brother, Michael. Blank graduated from Stuyvesant High School in New York City and went on to attend Babson College, where he graduated in three years in 1963 with a B.S. degree in business administration and accounting. He also received an honorary degree from Furman University. In 1978, Blank co-founded Home Depot with Marcus. New York investment banker Ken Langone assembled the initial group of investors and merchandising guru Patrick Farrah helped founders realize their vision of one-stop shopping for the do-it-yourselfer. The store revolutionized the home improvement business with its warehouse concept and Blank and Marcus became billionaires as a result. Blank spent 19 years as the company's president before succeeding Marcus as CEO. Blank retired from the company in 2001 as co-chairman. Today, Blank is the Chairman, President, and CEO of AMB Group, LLC, and chairman of The Arthur Blank Family Foundation. He serves on the Board of Trustees of Emory University and the boards of Staples and Cox Enterprises. In February 2002, Blank purchased the Atlanta Falcons franchise in the National Football League from owner Taylor Smith, the son of team founder Rankin M. Smith, Sr.. In September 2004, he bought the Arena Football League franchise, the Georgia Force; he moved the team back to the city of Atlanta after it had spent several years in suburban Gwinnett County. Blank has expressed serious interest in purchasing other franchises. In early 2006, he temporarily withdrew from contention as a potential buyer of the Atlanta Braves of Major League Baseball. Some months later, Blank re-entered serious talks with Time Warner and a report indicated that a sale was imminent. However, in February 2007, the Braves completed the sale of the team to Liberty Media. Blank has also founded an expansion MLS franchise named "Atlanta United FC" to begin play in 2017. The club will share Mercedes-Benz Stadium with the Falcons. Blank has been married and divorced twice. He has three children with his first wife, Diana J. Blank (born 1942): Kenny, Dena, and Danielle. In 1995, he married Stephanie V. Blank (born 1968), a Blowing Rock, North Carolina native and Appalachian State University graduate he met when she worked as a designer at a Home Depot store in Atlanta. They had three children - Joshua Blank, Max Blank, and Kylie Blank - before being divorced. Blank is married to Angela Macuga, who has three children from a previous marriage. Blank also owns Mountain Sky Guest Ranch in Emigrant, Montana; and PGA TOUR Superstores. On February 9, 2016, Arthur Blank revealed he had very treatable prostate cancer. On March 17, 2016, Blank announced that he is cancer-free following treatment. In 2011, Blank was the recipient of the Freeing Voices, Changing Lives award from the American Institute for Stuttering. Blank was inducted into the Junior Achievement U.S. Business Hall of Fame in 2006, and in 2005 he was named National Entrepreneur Of The Year by Ernst & Young LLP. In 2003, for the second time in three years, Blank was named Georgia's Most Respected CEO by Georgia Trend magazine. In 2014, he was inducted as a Georgia Trustee, an honor given by the Georgia Historical Society in conjunction with the Governor of Georgia to individuals whose accomplishments and community service reflect the ideals of the founding body of Trustees, which governed the Georgia colony from 1732 to 1752. ↑ "Our History". homedepot.com. The Home Depot. Archived from the original on 21 January 2011. Retrieved 8 January 2011. ↑ "ARTHUR BLANK - OWNER AND CEO". atlantafalcons.com. Archived from the original on 8 January 2011. Retrieved 8 January 2011. ↑ "Atlanta's new Jewish life - Israel Jewish Scene, Ynetnews". Ynetnews.com. 1995-06-20. Retrieved 2012-01-25. ↑ "International Civil Rights Walk of Fame". 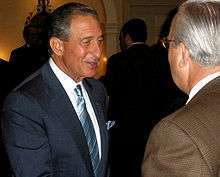 ↑ "Arthur Blank - Owner and CEO - Biography". Archived from the original on 2007-12-17. Retrieved 2007-11-01. ↑ "AMB Group names key executives". Atlanta Business Chronicle. 20 June 2001. Retrieved 8 January 2011.